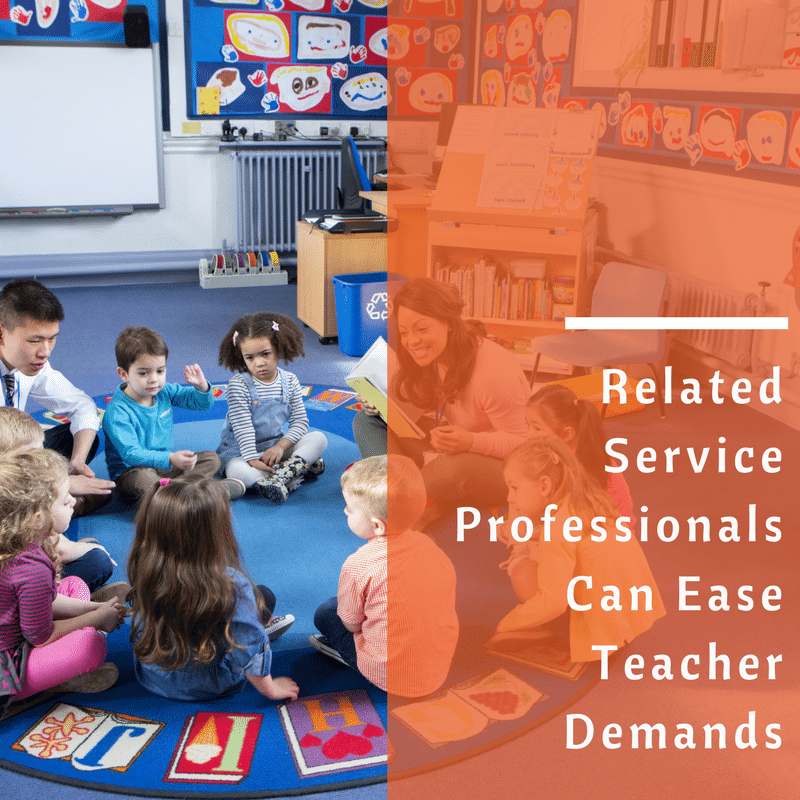 Related service professionals are a key component to many students’ success in education. For many students who receive special education services, related services, such as occupational therapy, speech and language therapy, or hearing support, are a factor which helps to make his or her educational experiences more meaningful and worthwhile. Despite these opportunities, many teachers hold a strong dislike towards these professionals due to the disruption faced on the teacher’s behalf. I have one thing to say to those teachers: Get over yourself. Teachers today, especially in the public school system, are faced with a multitude of intrusions in each day’s teaching. Will Billy be on time today? Will Sara have had breakfast? Did I make enough adaptations to Jim’s test for today? Will Olivia’s aide be able to help her with notes? Did I remember to shut my kitchen sink off? You get where I’m going. Teachers are absolutely amazing human beings who brighten lives, inspire students, and make the impossible possible, every, single day. However, teachers are always inevitably asked to do more, especially if they’re already really good at their job. There were some days in the classroom where I honestly thought that if I had permanent guardianship over the students in my classes that my job would be easier because, well, I’d only have to rely on myself. I know what I’m capable of doing and how to make plans a reality. I can manage my time well, teach a lesson, console a mourning student, guide a paraprofessional on how to support a student, catch students up, while challenging those hungry for more content, all within a class period. As a teacher, I can do it all. BUT it shouldn’t be that way – and it doesn’t have to be that way – when it comes to the students in your classes whom are eligible to receive related services. In my educational career, I have worked with countless related service professionals, and some sought me out for ideas and schedules, while others seemed to be aimed to correct every word that came out of mouth and avoided me like the plague. My best advice to you? Befriend all the related service professionals you can. They are more on your side than you know, and ultimately want to help make your job of wrangling 25 rodeo clowns more manageable. Teachers and therapists have totally different educational backgrounds and have different skill sets, all which when teamed together can make the student’s whole learning experience and long term maturation work most effectively. I interviewed Occupational Therapist, Dawn Schlosser-Repsher, OTR/L, who has worked in a multitude of school settings, across all grade levels to learn how teachers and related service professionals can best work together to make a harmonious partnership to ultimately most benefit the students shared. Q: What is one pet peeve you have for how some teachers manage student behavior? A: My biggest pet peeve is teachers who take recess away from kids. Most kids, especially those with ADHD, need recess. Recess is not a privilege to be taken away, but is actually a necessity. Making kids stay in to do work when they already can’t focus is only making the problem worse. Students of all ages require regular mental and physical breaks in order to return to a high level of concentration and focus, required for many new learning opportunities. Q: How do teachers and related service professionals school days differ? Do you work a standard school day, like teachers? A: No, I am not a salaried employee. I wish teachers understood I am a contractor with no benefits, no paid days off, no prep time or paperwork time or down time. I get paid for the students I see, which are usually scheduled every 30 minutes I am at school. I often don’t even eat lunch. A lot of my hours are unpaid and I buy all of my supplies and prepare activities on my own time. I know some teachers do also, but all of the materials I use during therapy sessions are sourced from my own income. I see so many teachers complain when they don’t get to lunch on time, while I am shoving a granola bar down while seeing kids. Some therapists do schedule lunch, but it often gets missed because of consulting about students or adding new ones. Our caseload is constantly changing with new referrals, evaluations, and screenings. If we go to an IEP meeting, we have to make up the students we missed seeing. No one covers for us in the event that we are out sick, or pulled into a meeting at the last minute. Q: How can teachers and related service professionals foster a healthy relationship? A: I don’t expect teachers to know what I know and vice-versa because we have different backgrounds and I would not be needed if they had my education/experience. I have great respect for the teachers I work with. I like being able to help teachers and the students they are concerned about develop a plan to make a student more successful in teachers’ classrooms. With the push for inclusion, teachers are expected to handle more than they were ever prepared for. If I can make this any easier for everyone involved, I am thankful. There were many days when I taught full-time in the classroom where I did not take a lunch break and was pulled into mandatory meetings on the spot. The difference though? I was more apt to be able to stick to a schedule because I had set times that classes would begin, and also had a daily planning period built into my teaching schedule. Also, I had no idea that many therapists only get paid for the students that they see and pre-planned meetings attended. They typically do not have any sick days, and in the event they can’t be in on a scheduled day, it is up to them to make-up missed therapy sessions with students. Talk about not being able to catch a break! One student in my class had nearly unreadable writing. And I taught English and writing composition. There wasn’t any way we were not going to have to write. I shared my concerns with the occupational therapist, along with some future assignments that would require the student to write. In this conversation, we were able to develop strategies to help the student in and out of my class with writing, and Joey also received some extra feedback on those high stakes assignments I shared. Win! When I worked as a special education case manager, I had a student on my caseload who had cerebral palsy, walked with the aide of crutches, and had a vision impairment. He desperately wanted to take Materials Processing (Wood Shop) as an elective. Read: Sheer terror in my eyes! The anxiety I had about this problem kept me up at night and made me want to alter his schedule in any way I could to keep Materials Processing out of his schedule. Because the OT and I had a great working relationship, I decided to share this with her. To my utter amazement, she solved my problems and made my student’s dreams come true. She scheduled her OT session with him DURING his Materials Processing class so she could help him with the cutting and sawing demands of the class. Talk about a lifesaver and a dream maker! *Reach out to related service professionals early on to begin discussions on schedules, time restraints and requirements, and to start an open dialogue about the students you may share. *If you already know the student(s) whom you will be sharing, offer some ideas for needs that you see the student may have. Even if you don’t feel a need is related to what the related service professional may be able to provide, chat about it. Because you both share different educational and experiential backgrounds, it’s better to share more information in the possibility of developing a solution, instead of regretting to mention a need. *Propose times that would work best for you and the student to receive the services. By proposing ideas early, the therapist may have more options available to work the student into their own schedule. *Check in often. Remember that the related service professional likely does not get compensated for impromptu face-to-face meetings, so reach out with an e-mail or voicemail whenever necessary or if a need arises. Don’t wait until mid-year or prior to an IEP meeting before mentioning something that might be beneficial for the therapist to know. *Provide feedback on the goals that the therapist is helping the student work towards. Seem like no progress is being made? Mention it? Has the student already achieved a goal? Let it be known so that other goals may be considered. *Mention to the student and the professional what the student will be missing during your class time. There is a chance that the therapist may be able to also work on that task during the therapy session, dependent on what the student’s goals are. *Running into a problem? Unsure of how to accommodate the student? Feel free to run this concern by the therapist, perhaps she will have some ideas for how to implement a new strategy in the classroom. *Remember, we’re all professionals. At the end of the day, we are in education, because we have a passion to help students succeed. The goal is to use all the resources available to us to help make that job as effective as possible. Collaboration is important, encouraged, and helpful. Some other resources when learning how to best collaborated with related service professionals can be found here. Teachers face daunting tasks every day and with the ever-increasing demands on them, it sometimes seems like there will never be a limit to what is asked of teachers. While there are many factors to address to help ease this problem, teachers should remember that collaboration is useful, even when not mandated by professional development days. By sharing your true thoughts, ideas, and concerns with those that work closely with you, there’s a chance that your load will be lifted and problems eased while further benefitting the needs of the students in your class.